AIIMS PG Counselling 2019 has been started by the All India Institute of Medical Sciences. Vacant seat position for open counselling of MD/ MS/ DM (6YEARS)/ MCH (6YEARS)/ MDS has been released by AIIMS. 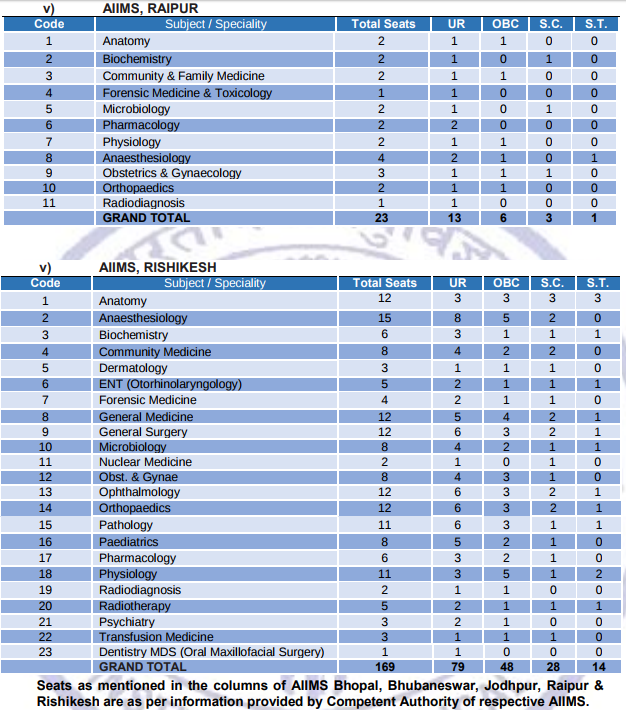 Rank wise list of all Candidates who applied for Open Counselling for MDS/MD/MS Course Jan 2019 Session was released earlier. AIIMS, New Delhi conducts the entrance exam twice a year, for January and July sessions for admission in Post graduation courses offered by AIIMS including DM, M.Ch, MD, MS, MDS, MHA. Candidates who have qualified in their AIIMS PG Entrance Exam 2019 are eligible for AIIMS PG Jan 2019 Counselling. Rank card issued after the result is required for counselling. 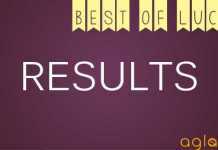 Get here AIIMS PG Counselling 2019 complete details. Latest: Vacant seat position for Open Counselling of MD/ MS/ DM (6YEARS)/ MCH (6YEARS)/ MDS to be held on February 22, 2019, has been released. Scroll down to check the same. Here we mentioned the important dates regarding the AIIMS PG Counselling 2019 MD / MS / M.Ch / MDS. Candidates are advised to visit our article or official website for latest update regarding the AIIMS PG Counselling 2019 MD / MS / M.Ch / MDS. Click here to check the notice regarding Open Counselling for MD/MS/ MCh(6 years)/ DM(6 years)/ MDS January 2019 Session. Click here to check Seat Allocation Process for MD(Hospital Administration) to be held on December 18, 2018. Click here to check the guidelines for the 1st round of online counselling for MD/ MS/ DM (6YEARS)/ MCH (6YEARS)/ MDS January 2019 session. Click here to check the FAQs for Online counselling for MD/ MS/ DM (6YEARS)/ MCH (6YEARS)/ MDS January 2019 session. Click here to check the vacant seat position for Open Counselling for MD/ MS/ DM (6YEARS)/ MCH (6YEARS)/ MDS. Click here to check the vacant seat position for 3rd round of Online Seat Allocation /Counselling for MD/MS/MCh(6 years)/DM(6 years)/MDS. Click here to check the vacant seat position for 2nd round of Online Seat Allocation /Counselling for MD/MS/MCh(6 years)/DM(6 years)/MDS. 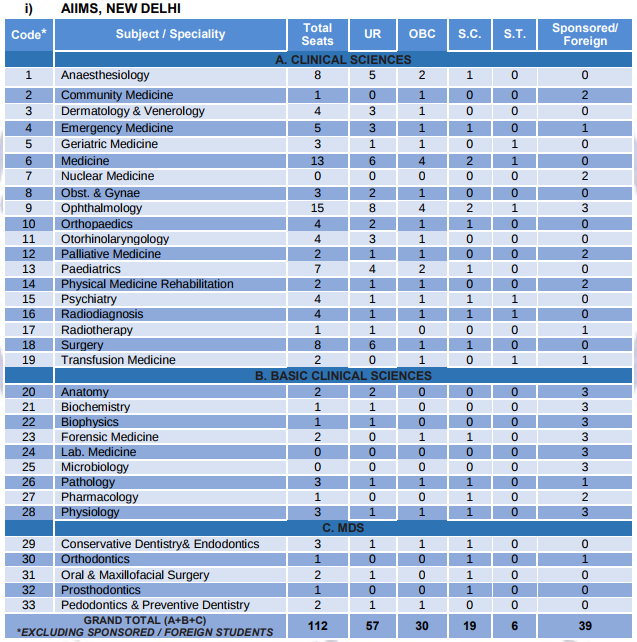 All India Institute of Medical Sciences releases the candidates list who applied for Open Counselling for MD/MS/ MCh (6YRS) /DM(6YRS) Course Jan 2019 Session on the official website. Candidates can also check it the direct link provided below. 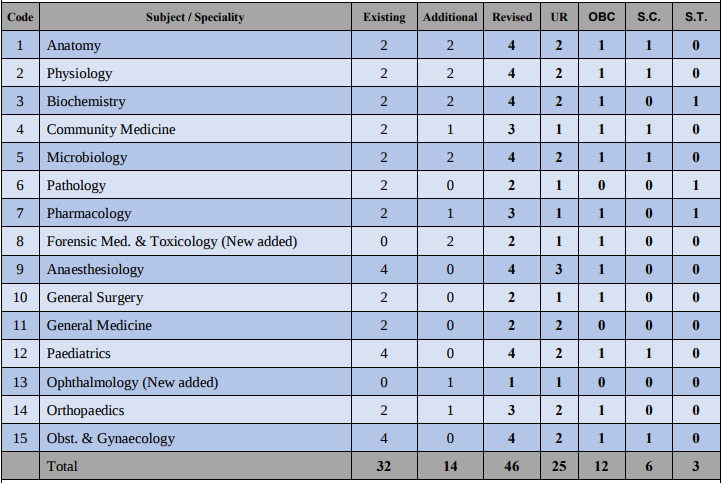 Click here to check Rank wise list ALL Candidates who applied for Open Counselling for MD/MS/ MCh (6YRS) /DM(6YRS) Course Jan 2019 Session. After the counselling process, seat allotment for AIIMS PG for the January 2019 session has been started. Candidates qualified in the examination had to exercise the choices. 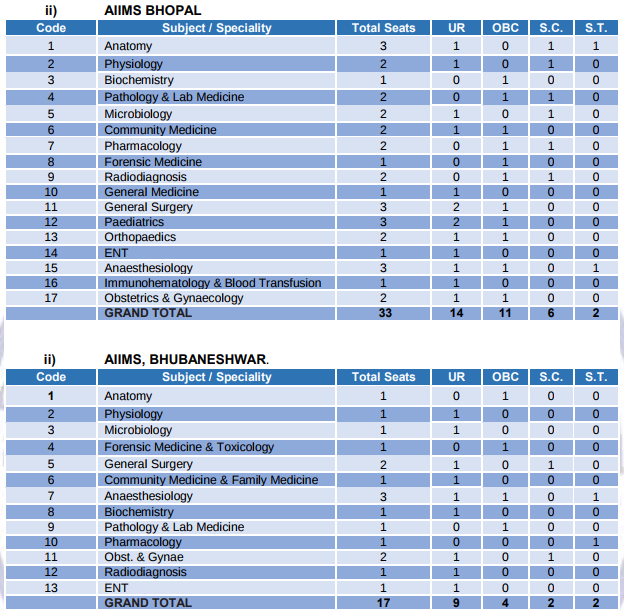 On the basis of the choices exercised the candidates are allotted seats in the AIIMS for 2019 January session. Seat allocation can be checked from the link provided below. Click Here to Check Result for Round 2 Seat Allotment. Click Here to Check Result for Round 1 Seat Allotment. Click here to check the Mock round Online Seat Allocation for MD/MS/MCh(6 years) /DM(6 years)/MDS, January 2019 Session. In each category the number of candidates call for counseling will be 8 times the number of seats. The order of counseling will be General/50% AIIMS preferential candidates of total MBBS seats of AIIMS/ST/SC/OBC. The counseling will be done strictly by combined merit list starting from Rank No.1. The candidates in order of merit will exercise their choice of subject according to the availability of seats. In the case of absentee, the next candidate in merit will be considered. When a reserved category candidate (who is in combined merit list) is called according to combined merit list, he/she will simultaneously be given an option to exercise his/her choice of subject both in unreserved category and his/her concerned reserved category. If such a candidate opts for the subject which is available at the time of his/her counseling, both in unreserved category and reserved category, he/she will be given seat only from unreserved category as he/she is in merit and will be treated as an unreserved candidate and will consume an unreserved seat. He/she will be given the reserved seat only when his/her choice of the subject is available in the reserved category only, not in unreserved category and then will consume a reserved seat. When all the seats of unreserved category are finished then only counseling for reserved category will be conducted. In case, during the open counselling any ST seat remains vacant (after calling all eligible candidates of ST category) then this seat will be made available to the eligible SC category candidate and vice versa and even after doing this, if any, SC/ST seat remains vacant (after calling all eligible candidates of SC/ST category) then this vacant seat shall be made available to the eligible General Category candidate. Similarly, in case the OBC seat remains vacant after calling all eligible OBC candidates then this vacant OBC seat shall be made available to the eligible General Category candidate. Candidate will have the right to choose any one of available seats in the discipline of his/her choice at his/her turn as per merit at the time of counseling and confirmed seat will be allotted to him/her after submission of requisite undertaking thathe/she has not already done or pursuing MD/MS/MDS course in any subject at the time of counseling. However, if a seat opted by candidate is not available at his/her rank/turn then he/she can choose another subject provisionally and his provisional seat or seat available at his/her turn will be confirmed only in the second counseling. All the candidates who have been allotted confir _med seat during 1st counseling shall deposit fee and after getting themselves medically examined by a Medical Board constituted by the Institute, they will join the course. If they fail to deposit fee/join after depositing fee, then they would lose to them and the seat allotted such candidates will not be eligible for 2nd counseling. Any candidate (Indian citizen) who has taken admission elsewhere in India & Abroad and have deposited all his/her original certificates with that concerned College/ Institution will be allowed to attend the first counseling at AIIMS subject to the condition that he/she provides the documentary evidence from the said College regarding deposition of documents in that College. A seat purely on provisional basis will be offered to him/her depending upon the availability of a seat at his/her rank and the choice exercised by the candidate. A confirmed PG seat during the 2nd counseling will only be allotted to such candidate after submission of requisite undertaking as mentioned in preceding Para, resignation acceptance letter/order issued by that college/Institute and after depositing all original certificates. In case due to unavoidable circumstances any candidate is not in a position to appear in person on the notified date of 1st counseling, his/her authorized representative with an Undertaking and Authority letter for allotment (Proforma for Undertaking and Authority Letter as per Appendix-I & II of call letter) may participate along with original documents/production of documentary evidence from the college about retaining of original documents by that college/institute, if candidate has taken admission elsewhere. In such cases, a seat will be offered purely on provisional basis at his/her turn and same will be confirmed only if candidate attends 2nd counseling himself/herself and submits requisite undertaking, produces the resignation acceptance letter/order issued by that college/Institute (if applicable) and deposits all original certificates. If the candidate/authorized representative of candidate fails to report in 1st counseling, then his/her candidature will not be considered for 2nd Counseling. Candidates or their authorized representatives participating in the counseling process are required to maintain proper decorum/discipline at the time of counseling. In case of any dispute arising out of the allocation of a seat at the time of counseling. The decision of the Chairperson of the Counseling Committee will be final. All disputes pertaining to the conduct of the examination by the AIIMS, and the allocation of seats in various subjects by counseling will be subject to the jurisdiction in the High Court of Delhi. No TA/DA will be paid by the Institute to the candidate for appearing in the entrance examination and for attending the counseling/joining the course. Please note that the candidates who have already done/pursuing MD/MS/MDS in any subject at the time of counseling shall not be considered for admission to MD/MS/MDS courses, if it is found at a later stage that the candidate has given false undertaking at the time of counseling, his/her candidature/registration will be cancelled. The confirmed PG seat will be allotted to the candidates only after giving an undertaking as above and after depositing all original certificates. The candidate who will confirm seat during counseling will have to go through biometric verification. In addition to that biometric verification will also be done at the time of joining. In case there is any doubt about identity during such verification, such candidates will be allowed to participate in counseling provisionally. These candidates (who are allowed to appear provisionally) will have to give an Important:undertaking in the prescribed proforma and will present themselves before counseling Committee on the next day of Counseling at 11:00 AM in Dean’s Committee Room where the decision about their candidature will be made. If such candidate(c) fail to appear before this committee, he/she will be considered ineligible for next round of counseling and seat allotted to him/her will be released during next round of counseling. No claim whatsoever of candidates will be entertained if he/she fails to present before counseling committee on next day at 11:00 AM in Dean’s Committee Room. The facilities for post-doctoral courses are available in the following super specialties.